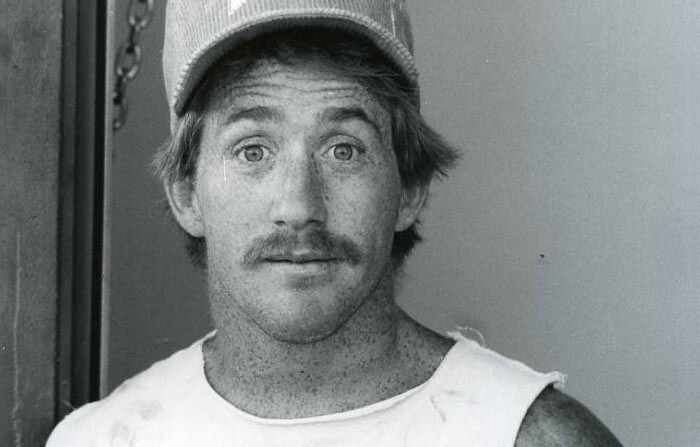 A very sad day in motocross history. Team USA legend Danny "Magoo" Chandler crashed while doing a rodeo whip off of the finish line jump at the Paris-Bercy Supercross. He lost control of the Kawasaki he was riding when a photographer's flash went off right as he was in the middle of his trick. He came down with his left hand missing the bar and blasted into some hay bales lining the track and went over the bars. The crash left him with a broken back and paralysis from his chest down. Chandler was immediately taken to hospital and put on a ventilator. He would never walk again. In the extended documentary below, the crash takes place just after the 53-minute mark. Please proceed with caution, it is not easy to watch. As for the Paris race itself, new Kawasaki rider Ron Lechien and Yamaha rider Rick Johnson, in his last outing on the brand before joining Team Honda, crashed together and knocked one and other out. The race winner was Honda's Johnny O'Mara, followed by Yamaha's Broc Glover, and Dutch Honda rider Davey Strijbos. Danny Chandler passed away on May 5, 2010. Cycle News reported on the recent amateur supercross race held after the late-November Anaheim Supercross. Among the riders mentioned in the story were future series champions Johnny O'Mara and Rick Johnson, as well as top local prospects like A.J. Whiting, George Holland, Mike Healey, Erik Kehoe, and Micky Dymond. "King" Richard Burleson, the eight-time AMA National Enduro Champion and all-time off-road great, parted ways with the Husqvarna brand after a 15-year run. Husqvarna had been sold to Cagiva in Italy and decided to close its Ohio racing department, where Burleson worked after he retired as a full-time racer. Team Suzuki's Roger DeCoster wins his second straight Trans-AMA race, this time at Saddleback Park, but his Suzuki teammate Sylvain Geboers is already the Trans-AMA Champion. 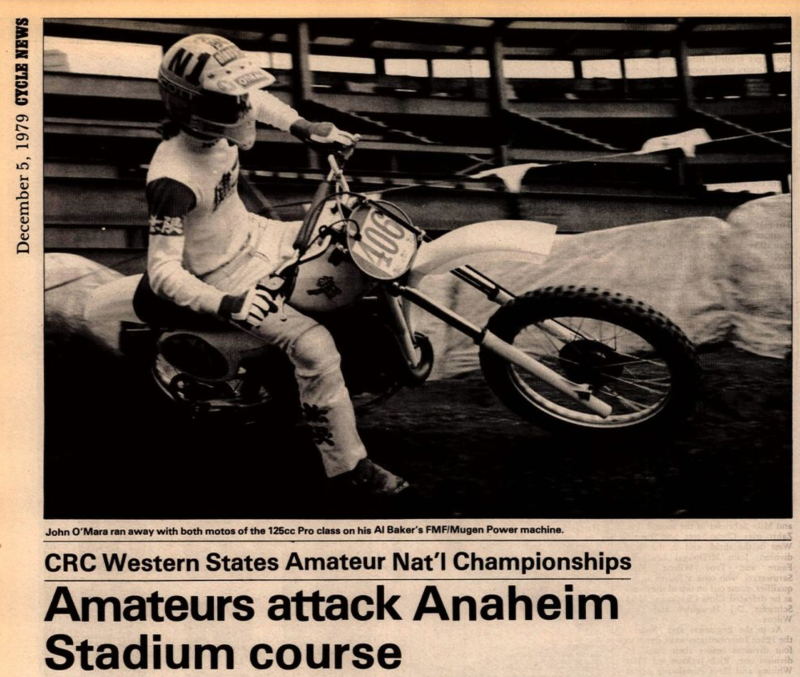 The top American in the race is eighth place Mark Blackwell, but he is also the only American in the series, so the AMA declares him the de facto U.S. 500cc National Champion, despite the fact that an actual AMA Pro Motocross Series will not get up and running until 1972. 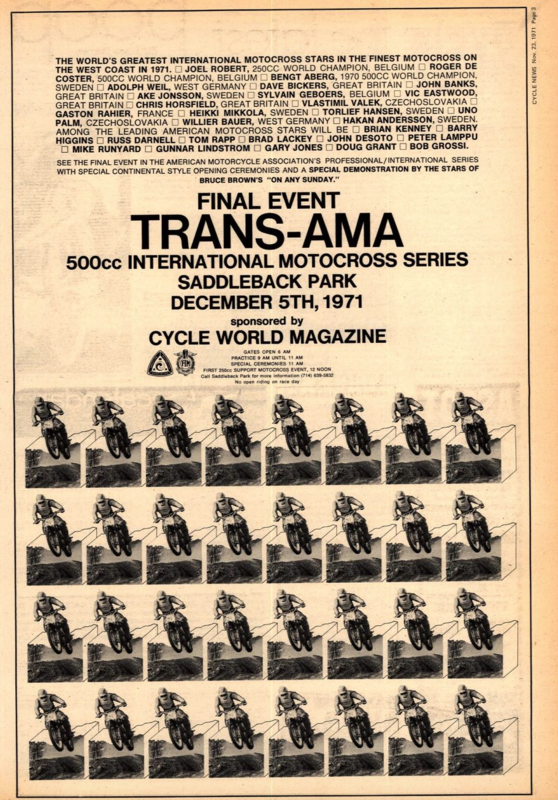 Poster for that last Trans-AMA of 1971. 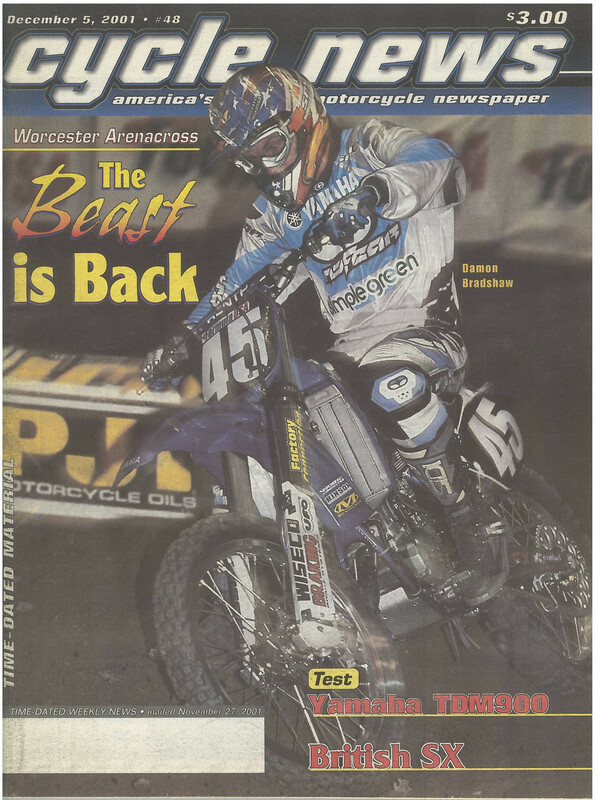 Damon Bradshaw, enjoying a fun comeback as an arenacross rider and racing for the first time since 1997, wins two nights of the Worcester, Massachusetts, AMA National Arenacross Championship and lands on the cover of the December 5, 2001 issue of Cycle News.